We review the most popular Nissan 350z supercharger kits available on the market today. This is the ultimate 350z supercharger kit guide. The fifth generation of Nissan’s ‘Z-car’ line, the 350z (Fairlady Z33 in Asia), was unveiled in 2002 and quickly became a huge hit with the worldwide tuning scene. Great looks, impressive stock power and a responsive rear wheel drive platform all contribute to making the 350z an excellent choice for enthusiasts. With the now 350Z cheaper than ever and boasting the reliable V6 power plant under the hood, it could well be the perfect time to own this great fantastic of machinery. Once you’ve upgraded your coilovers to improve your handling and exhaust to get the most of the looks, sounds and flow – what’s next? Whether you’ve owned your 350 since the initial release or you’ve just driven one for the first time, you’ll agree there’s no question that freeing some more power out of the 3.5L VQ35DE (and HR) could be all it takes to make this great car an epic one. Forced induction enables you to do this without the huge costs and concerns that are likely to come with an engine swap. We’ve already reviewed the turbocharged options out there, but what if the supercharger route takes your fancy? With zero lag and monster torque at the press of the throttle, supercharging is often a more reliable option and much more ideal for daily driving. If you decide to hit the track for drifting or racing then you certainly won’t be disappointed either! We’ve written this guide to help you narrow down the difficult decisions when it comes to supercharging your 350Z and find the perfect kit for your needs. Supercharger a little out of your price range? Then why not pick up an intake plenum spacer? Affordable horsepower for your VQ35DE..
Before we start, check out this supercharged 350z compilation video! Our comment: Legendary Japanese tuning house HKS kicks off the first option in our guide. HKS are well-known for creating some of the best forced induction kits on the market and this is certainly no exception. Combining great looks with reliability and the typical build-quality that HKS are world-renowned for, this kit is undoubtedly a great option. We would suggest strongly considering this kit if you’re more interested in reliability than power figures. This could be the perfect daily driver as it’s the quietest and arguably the most reliable option on this list whilst pushing out around 350-400hp with supporting mods. If the quest for ultimate power is your thing, make sure you also check out HKS’s V2 kit which is capable of running over 500hp with supporting mods! Drifting legend Nobteru Taniguchi gets behind the wheel of the HKS Supercharged 350Z in the wet as other drift OG’s such as Keiichi Tsuchiya and Vaughn Gittin Jr watch on! This dyno video shows off the sounds and performance of the HKS kit. Our comment: Vortech have put their years of valuable knowledge in the supercharging scene to create the ultimate kit for 350z owners. Combining great value for money with fantastic build quality, reliability and customer service. Not only that, it’s also one of the easiest kits to install (around 8-12 hours). With owners making an impressive 410hp from the kit and 440hp from the ‘Rev-Up’ variation, it’s easy to see why so many have made this their choice. This kit also includes upgrade options to gain additional power. Check out the video below where someone has managed to achieve a crazy 577whp! See and hear the Vortech kit working its magic on the dyno as an owner achieves a respectable 403whp. Watch this Vortech supercharged 350Z hit the track in this video. We love how he left the pits, but we’re not too sure if the track marshals did! Some of the most insane supercharger noises we’ve heard! It sounds like a jet and revs like a bike, watch this crazy 350Z hit 577whp at 17psi on a Voltech supercharger! Our comment: Stillen initially entered the 350Z supercharger market with a ‘roots’ style blower for the 350Z. This meant that you then had to run a Stillen’s own, or a modified hood to fit the supercharger. This, combined with the additional heat gains that came with the roots blower, it understandably divided opinions amongst owners. Stillen seemingly realised that this was the case and released a brand new kit to the market. Combining Stillen’s quality parts alongside the Vortech V3 supercharger reviewed above, they eventually put out a fantastic product. 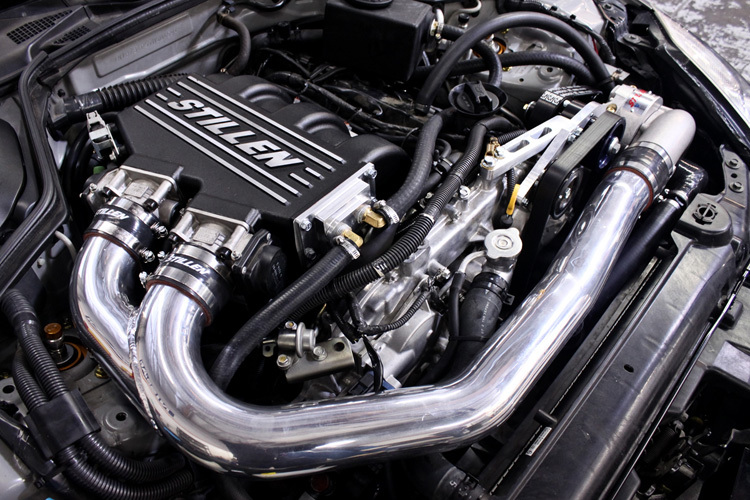 Given that Stillen decided to utilise the Vortech supercharger, we feel that it’s a testament to the fantastic piece of kit that Vortech have produced here. Given the similarities, you may well prefer the look of the Stillen kit over the Vortech to help make your final decision. There are many variations of this kit, so make sure you choose the correct one! Here’s the official Stillen 350Z supercharger video showcasing the kit on their demo car. You can see the hood which you were required to use with the original ‘roots’ kit. Here’s a sound clip of the revised Stillen kit using the Vortech V3 supercharger, allowing you to use the original hood. To pick our winner from this choice of 350Z supercharger kits we looked at a number of criteria; ease of installation, power levels, upgrade potential and price point. Based on these criteria we have conlcuded that the Vortech supercharger is the worthy winner. 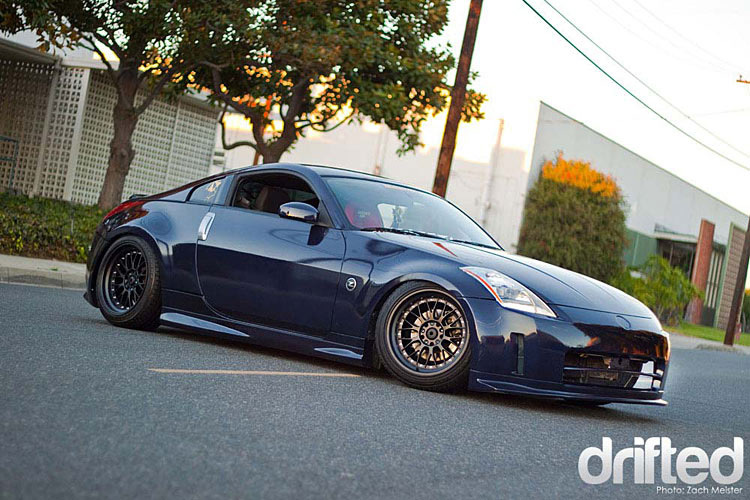 As an all-rounder, we felt that the Vortech Supercharger Kit was the best option available for the 350Z. It may not be the most impressive looking, but we feel it ticks every other box that potential owners will have in mind. From ease of installation, value for money and upgradability, this will future-proof your 350Z to ensure that you’re always at the top of your game. Thank you for reading our 350Z supercharger kit guide. Do you need a nice intake to mount on your new supercharger? 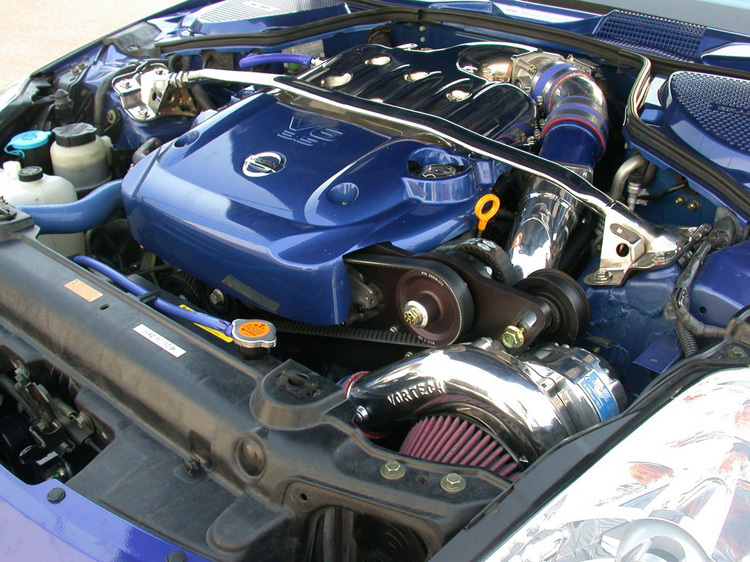 Then check out our 350z cold air intake guide. Want a small horsepower bump on a tight budget? Then take a look at our 350z test pipes guide. With forced induction dramatically increasing your VQ’s power level, your transmission will suffer. Our 350z clutch guide should help your gearbox survive the extra power.